These are replicas of a deck once made in 1877. The cards have a fascinating history which can be read below. The cards are poker-sized and have a cambric finish which is great for shuffles, fans and other card work. They feature a one-way back design which magicians might find useful. You can order one pack for $4.95, two packs for $8.95 or a dozen packs for $44.95. Squeezers also play an integral part in DJT’s latest instructional DVD release The Squeezer. The design is intriguing. One sees a menacing moon in the sky. Two bulldogs named Squeezer and Trip are tugging against their chains to try and kill one another. At the bottom of the card is printed the phrase, “There is a tie that binds us to our Homes”. What’s the hidden meaning? The pack is a replica of a deck made in 1877 when two major card companies worked out a neat, but currently illegal, sales agreement. The deck was designed to commemorate the merger of the New York Consolidated Card Company and the A. Dougherty Company, to be known as Consolidated Dougherty. Card magicians will know this name from the Tally-Ho decks popularized by the New York magicians of the 40s, specifically Dai Vernon. With the merger came the nice agreement to split up sales territory with each staying on his own home ground. The design pictures two ferocious bulldogs straining toward each other at the chains that bind them to their dog houses. One dog’s collar says “Squeezer” and the other says “Trip” for the companies’ respective brands. NOTE: Prior to the mid 1860’s, you didn’t see anything at all in the corners of playing cards. There were no suits or values in the corners. If a player wanted to see his or her entire hand, the cards had to be widely spread or moved from the front of the hand to the back one at a time. Around 1864, New York Consolidated made a brand called Squeezers with numbers in the corners like we use today. 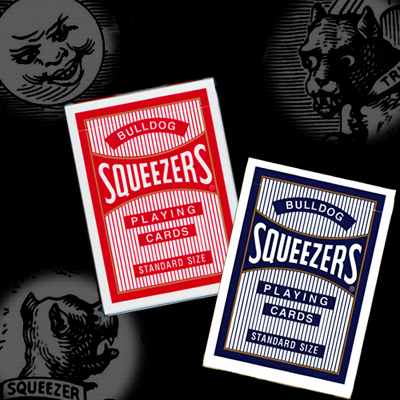 If you have ever cupped cards in your hand and sort of squeezed them into a fan to see the corner values you’ll quickly understand the name Squeezers. Poker players will almost always squeeze the hand into a fan so only the smallest part of the corners come into view. Dougherty had his own system. He reproduced the original card in the corners and called the brand Triplicate or Trips. Triplicates could be read three ways. Twice in the two corners and once by counting the center pips. Thus the name Triplicates or what has become known as Trips.